I thought you folks might like a few pictures of a boat I built from your plans. It's the 14' version of the Drifter. 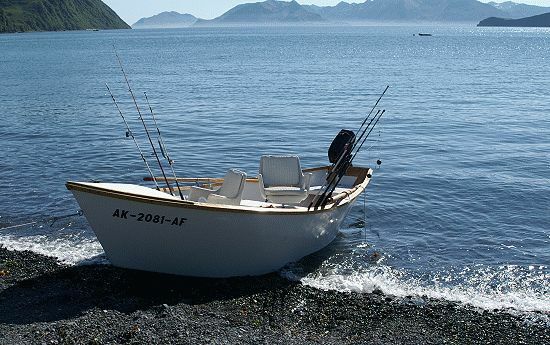 I use it for fishing in the bays around my home in Kodiak, Alaska. I used red oak for the stringers, chines and sheer clamps. 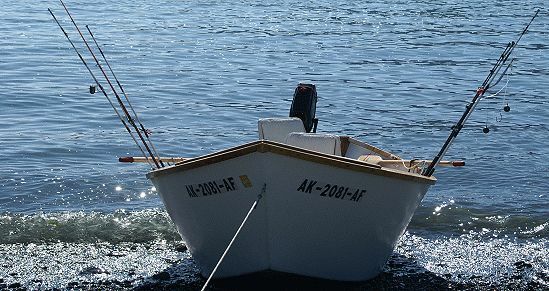 The little boat is small enough to be launched and recovered from numerous beaches around the island. The design does well in small surf and in light chop. 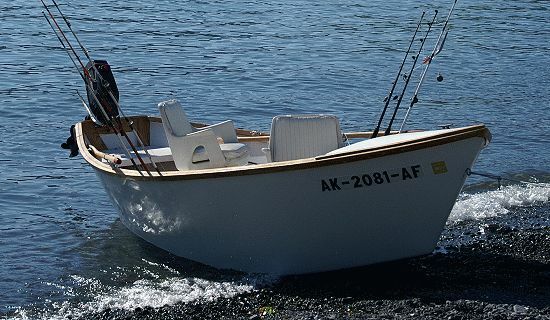 Driven originally by an 87 lb thrust trolling motor, it now a 3 horse outboard. Even in Alaska, the construction costs were only $1100.00. This was my first attempt at boatbuilding and if I thought there were a market for these boats, I would retire and build them for a living! P/S The line over the port side is connected to a freshly caught 87 pound halibut!